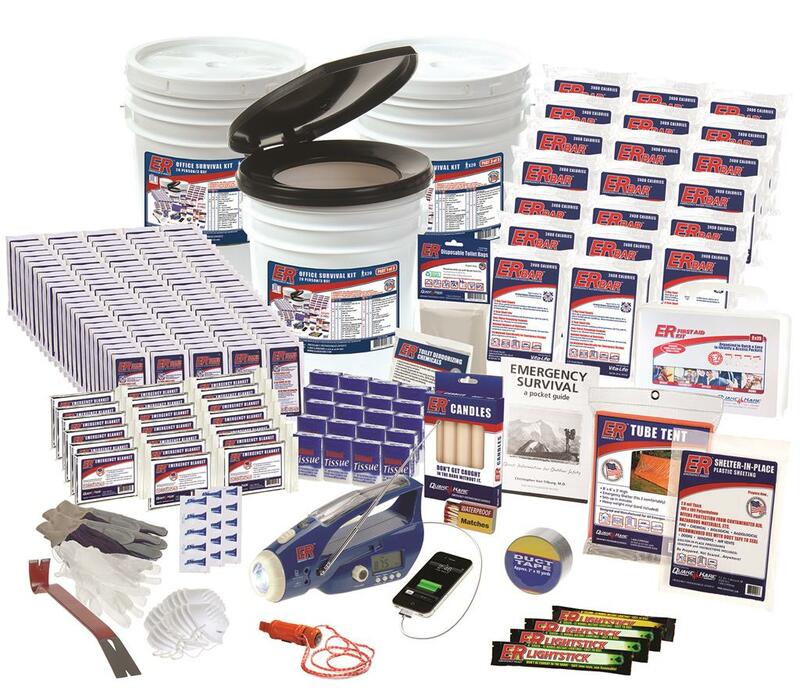 The 100-Person ER™ Survival Kit is designed for a small office and includes a 72-hour survival supply of food, water, lights, sanitation, shelter, rescue, radio/communication, and first aid for employees to evacuate or shelter-in-place in the event of a disaster. 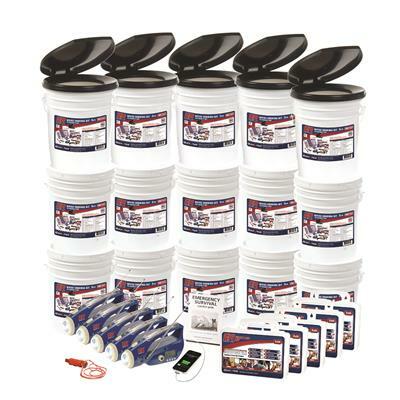 Each kit includes a 3-day supply per person of US Coast Guard Approved survival food and water that is guaranteed to last for 5 years even when stored in extreme conditions. This deluxe survival kit also comes equipped with a Solar and Hand-Crank Powered NOAA Weather Band / AM / FM Radio, Flashlight, and USB device charger to charge your smart phone and other devices. It never needs batteries! Simply recharge it using the hand-crank or solar panel. Plus, it charges any iPhone, iPad, Droid, Blackberry, and other USB devices so that employees can stay in touch with their emergency contacts following a disaster. 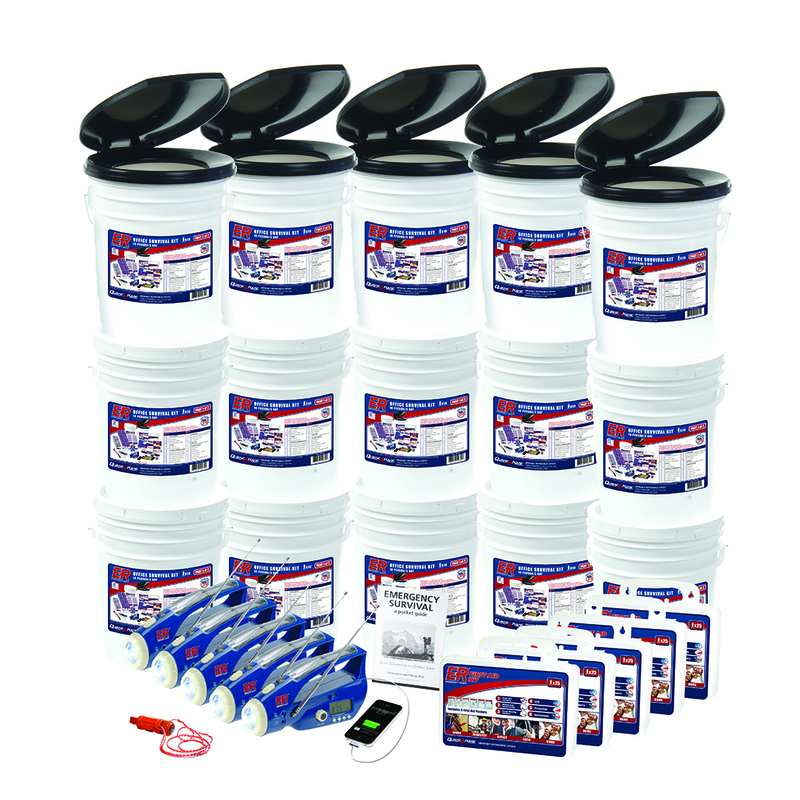 Packaged in sealed 5-gallon containers for strategic survival and storage advantages. The containers store safely anywhere inside or outside your office and can be used for emergency sanitation purposes. Dimensions: 15 containers; each 12" x 12" x 14"
A 100-person, 72-hour survival kit packaged in twenty 5-gallon water-resistant bucket containers with snap-on toilet seats. Ideal for a large office or school dormitory. This robust survival kit contains essential survival items needed by students and office workers to shelter-in-place following a disastrous event such as an earthquake, hurricane or tornado. The kit contains 2400 Calorie Food Bars and water pouches to provide 72-hours of nourishment for up to 100 people. In addition, the kit includes ponchos and thermal blankets for inclement weather, first aid supplies, a radio/flashlight combo that also charges cell phones, and other crucial items to help you survive any unexpected disaster. The food bars and water pouches are certified by the U.S. Coast Guard to store safely for up to 5-years even when exposed to extreme temperature fluctuations ensuring this kit can store safely inside or outside. The bucket container can be used to collect water or as a portable toilet with the included snap-on toilet seat.